Background Content: This skill paper investigates the ramifications of an alternative method to inject the iliolumbar (IL) and the dorso-sacroiliac ligaments (DL). Both the IL and the DL are very important to pelvic control and are needed for sacral stability. The IL and the DL are needed during functional and exercise activities but with the ligaments being injected only in the prone position they are not being supported in a variety of torsional positions. Purpose: The purpose of this skills section is to look at injecting the IL and the DL in a prone functional exercise position and also in a static standing position to provide both ligaments with the means to be injected during physical therapy exercise activities and during a torsional hip position. Study Design: Single case study. Methods: One subject, a 45 year-old male participated in this skill section. The participant used an exercise ball and went into the exercise position to strengthening the lumbar multifidus muscle. During that position, the iliolumbar ligament and the dorso-sacroiliac ligament was injected to provide stability to the pelvis during this physical therapy activity. The second position showed the participant standing with his right hip flexed in a posterior direction (as in walking up stair, an incline or during sitting) and then the IL ligament was again injected. Conclusion: Since physical therapy can put undue stress upon the pelvis during exercises and rehabilitation, this injection method may provide a benefit for patients who experience lower back pain. The lumbar multifidus is a focal point in physical therapy rehabilitation. With strong ligament support for the lumbar spine and pelvis, the outcome for rehabilitation can become even more beneficial. The positioning will provide the treating physician with an alternative to conservative injections methods and give the ligaments in the pelvis the opportunity become even stronger. The spine is a flexible biomechanical system that will support motion from a variety of positions and contortions. The ability to do this is brought about by a vast array of intricate interwoven connections that include ligaments, joint capsules, discs, muscles and the nervous system. It has been demonstrated that in Western society, low back pain (LBP) is among the most costly ailments to treat and one of the most common reasons for patients to seek health care.1 Frymoyer et al 2 reported that the prevalence of the LBP was between 60 and 80% in the United States, which had a larger percentage of LBP cases than European countries.3 In the vast archives of the physical therapy literature, there has been much discussion regarding the importance of the lumbar multifidus muscle and its role in preventing recurrence, for patients with LBP.4-8 Evidence suggests that muscles are the body’s first line of defense against externally-applied forces.4, 9 A fully functioning neuromuscular system is the best guarantee of continued spine health. In order to see the importance of muscles to enable normal spine function, we need to discuss the anatomy of the multifidus muscle. The multifidus is one of the most medial and deepest portions of the low back muscles. The muscle is innervated by the medial branch of the dorsal ramus of the spinal nerve at each vertebral segment.1, 2, 4 Multifidus is usually divided into superficial and deep portions. The deeper portion spans one vertebral segment, while the more superficial portion spans several segments. The deeper portion is composed mainly of type one (slow fatigable) fibers, while the superficial portion is composed mainly of type two (fast fatigable) fibers.4 The multifidus is generally regarded as an extensor and side flexor of the spine. However, little regard has previously been given to its stabilizing function, a task which falls mainly to the deeper fibers.2, 4 But, what happens if there is a disruption to the multifidus due to injury and/or surgery and the bone to bone (ligamentous) system begins to experience increased demands for its stabilizing contribution? When this occurs, a person may have disruption in their spine segmental stability and this can lead to poorly-controlled segmental motion, sacroiliac dysfunction and decreased ability for a person to meet the demands of normal function. The ligamentous structures that we need to focus on are in the pelvis and lumbar spine. For our purposes, the major ligaments that we will focus on are the iliolumbar (IL) and the short and long posterior dorso-sacroiliac ligaments (DL). (See Figure 1.) Both of these ligaments will resist the bone to bone movement during daily activities. For example, the IL will resist motion at the L4-L5, L5-S1 segmental level as well as will resist ilium motion on the L5 segmental level. The DL will resist sacral motion in a posterior direction and this will aid stability of the S-I joint.10, 11 The joints are supported by these ligaments and if the muscles are not strong enough, motions can become restricted and painful. Since the ligaments of the pelvis and lumbar spine have to resist motion during an array of activities in daily life including work and recreation, we want to discover a way to enhance the stability of these structures. Figure 1. Illustration showing the left iliolumbar and the left dorsal sacroiliac ligaments as noted by the arrows. Courtesy of Primal Pictures, 2003. Prolotherapy has been discussed and used from the 1960s forward.12, 13 Much knowledge has evolved as regards the usage of a variety of natural medications, and also the structures that have been targeted.14Prolotherapy is most appropriate for patients who have CLBP and pelvic instability, ligamentous laxity. The literature supports the use of proliferation therapy for patients with LBP and also with knee injuries, ankle instability, lateral epicondylitis and even plantar fasciitis.15-19 The traditional way to inject the IL or the DL is to have the patient prone15-19 with a pillow under their trunk. Auburn et al, (2009) have shown an alternative functional method of injecting these ligaments by changing the angles at which the ligament will be stressed when an injection is applied. This technique was performed in a semi-standing position. We have taken the functional method one step further by having the patient (author two) move into the strengthening positions for the multifidus muscle and then applying an injection to the IL and the DL ligaments. Traditionally, the multifidus is strengthened in the prone position, but we have increased its recruitment by leaning over a ball and having the patient work in variety of patterns. (See Figure 2.) Bechtel, et al 20have shown that via rehabilitative ultrasound (RUS) the multifidus is more efficiently recruited in the quadruped position than in the prone position. RUS has been shown to be an effective tool to view muscular and ligamentous structures.21 Since the ligaments play such a significant role in the segmental stability during strengthening work, we wanted to have the patient work the muscle but also support the spine; thus we injected the IL and the DL during the particular strengthening activity. Quadruped position exposes the highly stressed areas of the ligament. By having the patient contract the muscle, stress on the ligamentous system is reduced thus reducing pain and giving the Prolotherapy a better opportunity to work. Being that we had the patient get into the exercise position and still used the rule that we would inject at the insertion of the ligamentous structure, this would not obviate the chances of the material getting into the ligamentous structure. We had the patient abduct their leg, putting more pressure on the multifidus, but also needing more stability from the ligaments to hold the position. (See Figure 3.) Therefore, by gaining muscular control in this position, we can increase the segmental stability, decrease strain on the ligaments and hopefully improve the effectiveness of the Prolotherapy injections. Figure 2. Illustration showing the starting position for multifidus strengthening and iliolumbar and dorsal sacroiliac ligament injections. Figure 3. Illustration showing the starting position with the leg abducted for multifidus strengthening and injections of the iliolumbar ligament as shown with primary author (AA). The alternative standing position was for injection of the iliolumbar ligament (IL). Our thought here is to put the one side of the pelvis in a position where it would expose the most-stressed portion of the IL prior to injecting it. (See Figure 4.) Why? Because if you take your right leg, as shown in the illustration, and move it where the knee and hip are bent into flexion, you will cause posterior rotation of the right ilium. When that occurs, you will stress the IL ligament and by injecting this ligament in such a manner you can achieve maximum effectiveness of the injections and keep the ilium stable during activities such as going up stairs, move from a sitting to a standing position and also when you are running. We believe that these new procedures should ultimately help patients to achieve the goals of smooth systematic fluid motion and pain-free function faster than traditional methods. Figure 4. Illustration shows the alternative injection method for the iliolumbar ligament or the long or short dorsal sacroiliac ligaments with Dr. Auburn injecting the Prolotherapy solution. Lee SW, et al. Relationship between low back pain and lumbar multifidus size at different postures. Spine. 2006;31:2258-62. Frymoyer JW. Predicting disability from low back pain. Clin Orthop Relat Res. 1992;(279):101-9. Loney PL, et al. The prevalence of low back pain in adults: a methodological review of the literature. Phys Ther. 1999;79:384-96. Bogduk N, et al. The lumbar dorsal ramus. Journal of Anatomy. 1982;134:383-397. Jackson M, et al. Multifidus EMG and tension-relaxation recovery after prolonged static lumbar flexion. Spine. 2001;26:715-723. Suter E, et al. Back muscle fatigability is associated with knee extensor inhibition in the low back. Spine. 2001;26:361-6. Keller TS, et al. Muscular contributions to dynamic dorsoventral lumbar spine stiffness. European Spine Journal. 2007;16:345-254. Matilla M, et al. The Multifidus muscle in patients with lumbar disc herniation. A histochemical and morphometric analysis of intraoperative biopsies. Spine. 1986;11:732-738. Solomonow M, et al. Biomechanics and electromyography of a culmulative lumbar disorders: response to static flexion. Clinical Biomechanics. 2003;18:890-898. Pool-Goudzwaard AL, et al. The sacroiliac part of the iliolumbar ligament. J Anat. 2001;199(Pt 4):457-63. Pool-Goudzwaard A, et al. 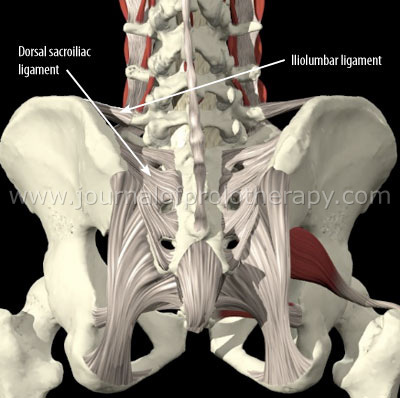 The iliolumbar ligament: its influence on stability of the sacroiliac joint. Clin Biomech (Bristol, Avon). 2003;18;2:99-105. Hackett GS. Prolotherapy in whiplash and low back pain. Postgrad Med. 1960;27:214-9. Hackett GS, et al. Prolotherapy for sciatica from weak pelvic ligaments and bone dystrophy. Clin Med (Northfield Il). 1961;8: 2301-16. Hauser R, et al. Prolo Your Pain Away! (3rd edition). Beulah Land Press: Oak Park, IL; 2007. Scarpone M, et al. The efficacy of prolotherapy for lateral epicondylosis: a pilot study. Clin J Sport Med. 2008;18;3:248-54. Jensen KT, et al. Response of knee ligaments to prolotherapy in a rat injury model. Am J Sports Med. 2008;36(7):1347-57. Hooper RA, et al. Retrospective case series on patients with chronic spinal pain treated with dextrose Prolotherapy. J Altern Complement Med. 2004;10;4:670-4. Klein RG, et al. A randomized double-blind trial of dextrose-glycerine-phenol injections for chronic, low back pain. J Spinal Disord. 1993;6;1:23-33. Reeves KD, et al. Long-term effects of dextrose prolotherapy for anterior cruciate ligament laxity. Altern Ther Health Med. 2003;9;3: 58-62. Bechtel R, et al. Efficient isolation of the multifidus muscle during rehabilitation. Presented at the AAOMPT conferences October, 2009 in Washington DC; (Poster presentation). Auburn A, et al. Prolotherapy for pelvic ligament pain: A case report. Journal of Prolotherapy. 2009;1;2;89-95.